Atlas Quest: A Whirlwind Tour! 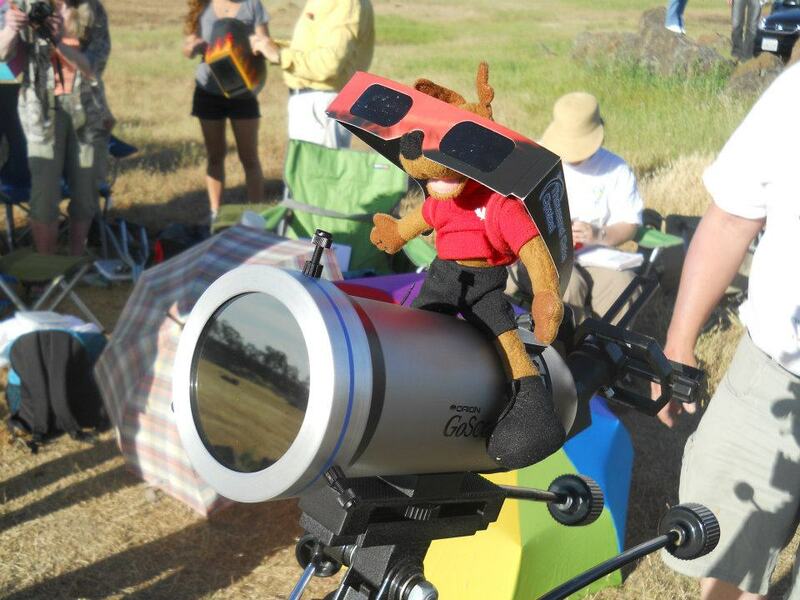 Wassa Jr. watches the eclipse safely with eclipse glasses. There are eight leftovers now in the AQ marketplace! Amanda, Wassa Jr., and I certainly have had an enjoyable last week or two traveling down to California and back for the Great Annular Eclipse of 2012! Originally, I intended to be hiking El Camino by now, but postponed the trip just because of the eclipse. We hiked to a bigfoot trap in southern Oregon. We stopped to visit Amanda's sister in Folsom, checking out her new home. The next evening, Doublesaj and Old Blue hosted us at their place where we feasted on pizza. of the eclipse from Hog Lake Plateau. Wow! I posted the photos I took on the AQ Facebook page--go ahead and check them out. (Special thanks to Featherhead for finishing my 2012 pinhole eclipse pattern for me!) The place was packed with letterboxers, but we were far outnumbered by all the non-letterboxers who headed out to view the eclipse--several of whom stopped by to purchase extra eclipse glasses from me and to take a look at the eclipse through my telescope. 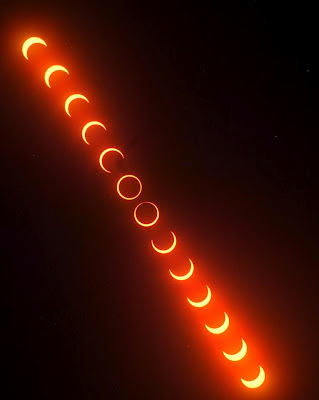 =) Speaking of which, I still have eight extra eclipse glasses. If you need some for the Venus transit on the afternoon of June 5th, I've put them up for sale in the AQ Marketplace. Details about when you can view the transit can be found on this page. Admittedly, it probably won't look very impressive through the eclipse glasses, but this will be your last opportunity to watch that black little dot transit the sun for 105 years. Amanda and I stayed long after sunset with a few other hearty letterboxers at which point we pointed the telescope to a beautiful crescent Venus, a dull red blog named Mars, and a spectacular view of Saturn's rings. Definitely a good night for planets! while we wait for help to arrive. The next day, Amanda and I decided to take an unplanned detour to Burney Falls--which I was familiar with from my PCT hike but Amanda had never been to. As it turned out, the most heart-stopping moment of the trip wasn't the eclipse, but a different sort of detour on our way to Barney Falls. 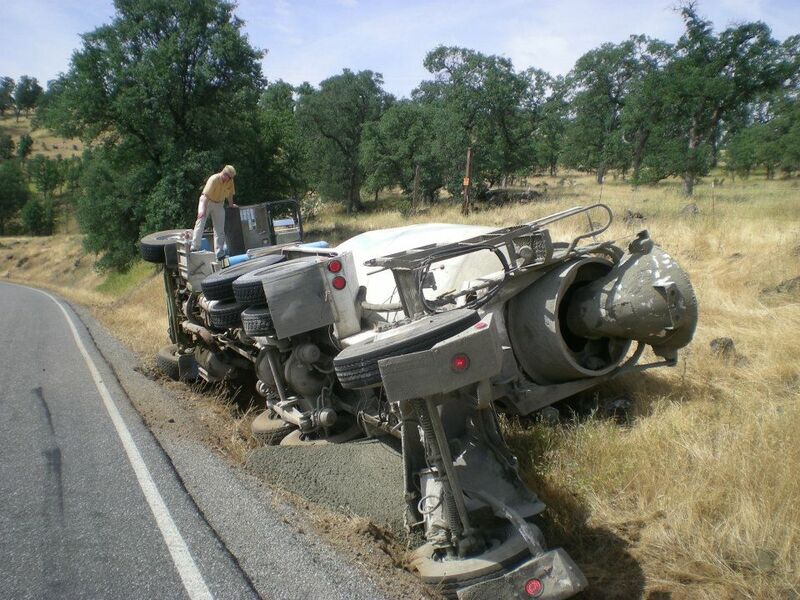 The concrete truck we were following lost control and crashed. Amanda stopped the car and I jumped out to help. Amanda's cell phone wasn't getting a signal, so I told her to drive off to a location where she could call for help while I tried to see what I could do for the driver the truck. 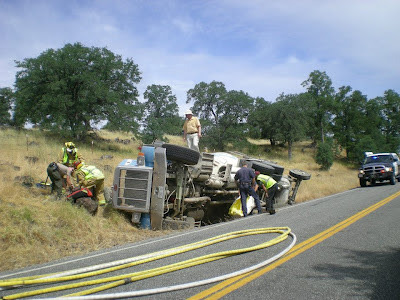 I could see the driver through the windshield, squished up against the passenger side door of the overturned truck. He was moving, but was definitely banged up a bit with blood on his face and shirt. I yelled over to Amanda to make sure they sent an ambulance along with whatever other rescue crews were on their way. I was also a little concerned about the liquid I saw spilling out from the underside of the truck. Fuel? Oh, please don't let that be fuel. Please don't let that catch on fire! Amanda had just gotten the car turned around when another vehicle arrived--a woman with a cell phone that did get a signal--so she called 911. I asked the driver if his leg was stuck and he didn't really answer--more of a grunt really--but he managed to move around and stood up in the cab. That was good, he's moving on his own and it didn't appear to be stuck. Well, he was stuck in the cab--but he had full movement within the cab. He was also a very big man. Easily over 300 pounds. How the heck would he get out of there? I didn't think he could fit through the windshield. I figured out how to climb up the truck and opened the driver side door--now the top of the truck--and kept talking to the guy. I found a fire extinguisher at the base of the driver's seat--a comfort, to be sure. And I asked the man if he could climb out, but he shook his head no. A couple of minutes later, another driver of a concrete truck driving in the other direction came along the accident scene who pulled over to help--and he was an enormous relief to have around. He knew the driver, used the radio in the truck to contact their employer, and pulled out paperwork about what the truck was carrying for the emergency crews--none of which I thought to do. He went into the truck and kicked out the windshield to help get more air for the driver. Another passing vehicle soon stopped to help. He had those orange cones in his car along with safety vests and a stop sign and started directing traffic around the wreck. Holy cow! Who carries that sort of stuff with them in the car?! It probably took at least 15 minutes for the first policeman to arrive, and within minutes many more police officers and firemen arrived. The policeman crawled in through the bashed out windshield to ask the driver a few questions and assess the situation, then a couple of paramedics arrived to take over. I watched from above, standing above the driver-side door. They got a neck brace around him and cut off his shirt. A fireman told the driver to cover his eyes as he bashed out the rest of the windshield with an axe and smashed the center metal part between the two windshields off and managed to squeeze the man through that hole. I was watching, slightly horrified, because I was sure that man was going to get stuck there. They got him out though, at which point I felt a little stupid standing on the truck where I was. Definitely nothing left for me to do anymore, so I jumped off and asked the policeman if there was anything he needed from us. Later, we learned that other letterboxers that morning at Hog Lake Plateau had seen all of the rescue vehicles headed to the wreck--unbeknownst to them where we were already at Ground Zero. from the rock cliff face! As for Burney Falls--a beautiful waterfall indeed--as pictures will attest! I've seen bigger waterfalls, and taller waterfalls, but Burney Falls is something special--where 100 million gallons of water per day pour out of the ground and crash over the cliff. During the summer months, 100% of the water going over those falls comes out of the ground in the mile leading up to the waterfall. You can even see the water coming directly out of the side of the cliff--the only waterfall I've ever seen this strange effect. .... And here I thought we had an exciting time with all the festivities all weekend long... You certainly had a wilder time while all we did was boxing at the plateau! I agree that the eclipse evening was the jewel in the weekend crown of fun. Thank you for sharing fun and knowledge with all of us there. Aw...my picture made it on your blog! How nifty and cool! Thanks so much for inspiring us to be there. I've been wanting to box Hog Heaven for years, been through there several times with no time to stop. It was so nice to see you and everybody, and I otherwise would have been sad about the gray day in Seattle obscuring our view if not for you. Thunderbird's Picture should be the May pic of next year's AQ calendar! Gorgeous! 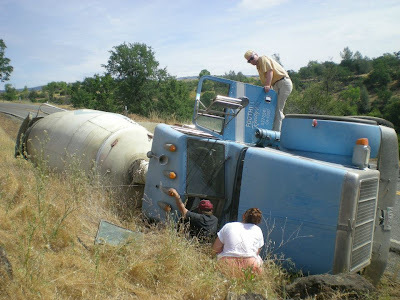 Man....I don't know what is crazier - the concrete truck or your hair!! LOL!